Experiencing this creative process either as a performer or as part of the audience forms a connection through participation. Sometimes this participation only goes as far as sitting and listening and sometimes people in the audience choose to join in with the dancing and singing and sometimes even the drumming! The Songo Drumming Project focuses upon cross cultural exchange, not just between the broad description of African and European but the cultures within these continents. The West, South and East African traditions are as different from each other as are those from England, Scotland and Ireland … and on another level, they are the same! It is that ‘sameness’ where the Songo Drumming Project occupies. ‘Songo’ is a word taken from the African pygmy language which generally means peace. The Pygmies are a group of people who live along the equatorial forest of Africa. They live a natural life respecting each other and nature and try they to be in peace at all times. 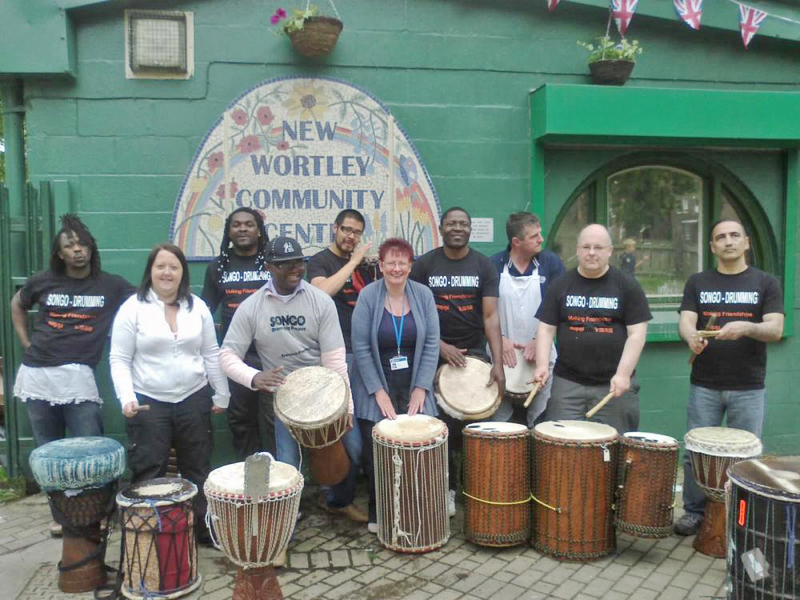 An ideal occasion for the Songo Drumming Project to help to build friendships and community cohesion is at community gatherings such as parties or seasonal events. The general idea is that people join in to whatever level they wish to and perceive the group as a whole where the distinction between performer and audience is blurred. A typical performance may open up with the group entrance gathering people’s attention before the space is occupied by the energetic sound of drum calls and engaging rhythms. A bit of audience participation! As a Songo performance progresses, the audience are encouraged (gently and only with willing participants of course) to become more involved. Young, old, all shapes and sizes can let their creativity flow and join in with either call and response singing or dancing.